Saturday Jun 30: This afternoon dying occurred - turmeric, vinegar, soda ash in a boiling solution onto muslin. The aroma triggered a yearning for curry. At 11:30pm I opened my eyes wide and realized I had not started my TdF. I found consolation in knowing I had my goal and fiber in mind, so re-affirmed those two thoughts and vowed to spin tomorrow. Sunday Jul 1: Countless "birds" were crushed, maimed and killed with my sweaty right hand that held tufts of cashmere and merino. 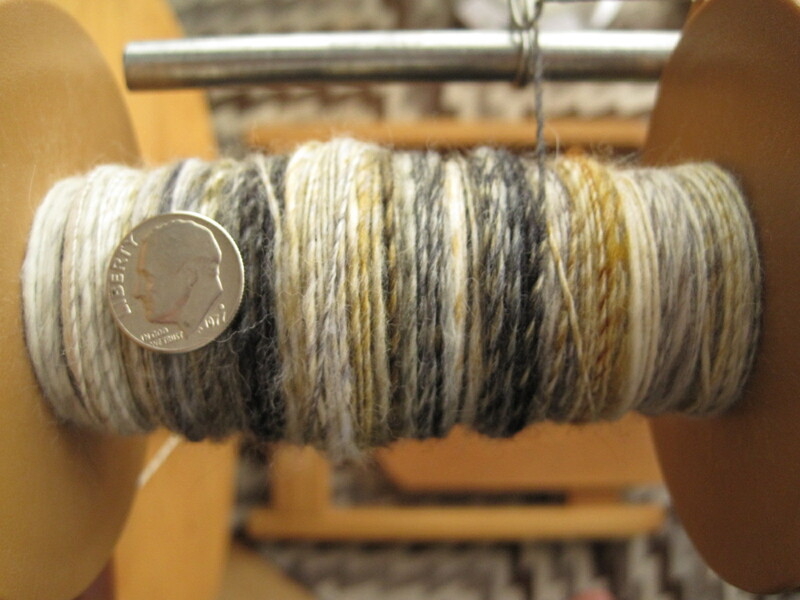 At least 3 false starts occurred in getting spun fiber onto the bobbin before my hands and wheel found their balance with this precious short-staple fiber blend. When I took this picture I intended to stop for the day. But my hands wanted to feel the fiber so I continued, putting aside the desire to eat (or do anything else on my weekend "to-do" list) and spin instead. Hours later, 2 ounces were spun, with 2 ounces of fiber remaining for another day. I don't know if I can spin this fiber in short periods of time - once a rhythm is established it is difficult to stop and re-start without losing consistency of spin. I suppose the consistency will occur with more practice. Then I went into the kitchen (in the early evening) and saw the bowls of rhubarb and strawberries that I'd prepared a day earlier, to be put into jars. I could no longer postpone this so I just did it. Recipe notes: 2# rhubarb, 2# sugar, 50g grated ginger, 1/4C lemon juice. 2# cut strawberries, 2# sugar, 1/4C lemon juice and a few shreds of lemon peel. Macerate fruits in different bowls for 2 hours then refrigerate for 24 hours. Bring strawbs to a boil several times, resting 5-10 minutes between each boil. This process gets the air out of the berries. Drain & divide juice & solids for each mixture (yields approx 4C juice, 4C solids for each fruit). Put 1/2 of each fruit's juice in pan, bring to boil until "set stage", skimming scum. Add 1/2 of strawbs & boil about 10min, then add 1/2 of rhub & boil another 5min or until "set stage". Yield 5C for this 1/2 batch (total yield 10C). Process jars. I'm a bit tired. But I feel like I've put money in the bank.